The sending of greeting cards at Christmas began in the Victorian era. 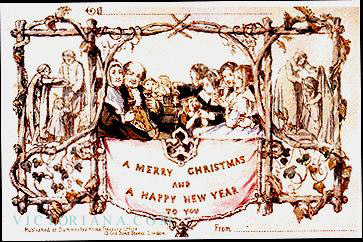 The first commercial Christmas card is believed to have been designed and printed in London, England in 1843. Over the years we have experienced clients moving from traditional Christmas cards to electronic and last year saw a decline in cards being sent at all. This year we are pleased to say that most of our clients have realised the importance of sending wishes of peace and success to suppliers and customers alike. So whether its an email message, a singing and dancing HTML design or a printed card we would like to say thank you – for cards received and to be received and for not letting cut backs in budgets stop the season of goodwill.